On 11 December 2017, Sri Lanka officially handed over the reins of the Hambantota port to a Chinese corporation. But the groundwork for this port, and the subsequent handover, began almost a decade ago, under the aegis of the then Sri Lankan President, and a strong China ally, Mahinda Rajapaksa. According to an extensive analysis by The New York Times, one of China’s largest state-owned enterprises – the China Harbour Engineering Company – handled the construction and renegotiation of the Hambantota port over the years. Ultimately in 2017, the Sri Lankan government came under the pressure of its Chinese counterpart, and handed over the port as well as over 15,000 acres of land surrounding it to China. How Did China Facilitate this Takeover? In 2005, China, which had historically enjoyed good diplomatic relations with Sri Lanka, provided the island nation with military and economic support in its civil war against the Tamil separatists. The last years of the war were notably fought under the leadership of Rajapaksa. By 2009, the war had ended, and Rajapaksa and his family was practically controlling the Sri Lankan government, with China negotiating with them through direct lines. When Rajapaksa announced his plans of a port in his home district Hambantota, countries like India refused to help, citing poor economic viability. However, China offered to pitch in, with an initial loan of $307 million via its EXIM bank. This, however, came at a cost. Quoting a Wikileaks document, the NYT reported that Sri Lanka was asked to take in the China Harbour company as the preferred builder, thereby hiring thousands of Chinese workers. Quoting a Sri Lankan official’s interview with The Times, the NYT further noted that China also expected some amount of intelligence sharing was also to be an integral part of the deal. Over the years, Rajapaksa’s ties with China grew stronger, with the former relying heavily on the latter for economic support. In fact, during the 2015 presidential elections, a large number of funds from the Chinese port construction company reached Rajapaksa’s campaign, the NYT reported, based on official documents stemming from a government investigation. According to NYT, at least $7.6 million was released by the Chian Harbour Company towards the campaign, all from a sub-account named “HPDP Phase 2”, revealed government investigation documents that were accessed by The Times. Meanwhile, the Hambantota port project weighed heavy on Sri Lanka’s finances, as the debt grew by leaps over the years, with Sri Lankan officials renegotiating the timeline and financing. However, China’s terms revolved around taking over equity rather than easing the terms. Although the handover effectively covered over $1 billion Chinese debt, Sri Lanka had accumulated other Chinese loans in the meantime, accruing high rates of interest, higher than other international lenders. In fact, Sri Lanka owes so much to China in terms of debt that Indian officials opined to NYT that China might be able to exert military use of Hambantota in exchange for debt relief. How Profitable is the Hambantota Project? When Sri Lanka approached Indian corporations earlier, regarding the development of Hambantota into a port, the Indian government turned it down, stating that it was not economically viable. In 2012, only 34 ships were docked at Hambantota, as against over 3,600 at the Colombo port. However, there have always been doubts over the profitability of the Hambantota port. According to NYT, an impatient Rajapaksa pushed for the port to be inaugurated on his 65th birthday in 2010, forcing Chinese labourers to pull long working hours. On 18 November 2010, the Magampura Mahinda Rajapaksa Port was inaugurated in a grand ceremony. 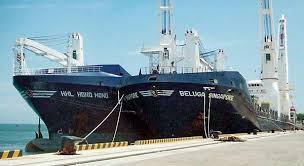 In 2012, despite the port only docking 34 ships, Rajapaksa remained determined to expand, leaning on China for an additional loan of $757 million. By the time the 2015 presidential elections rolled around, debts had risen accompanied by skyrocketing interest rates, giving the Opposition a major issue to fight the elections on. Subsequently, the new Maithiripala Sirisena inherited a debt-ridden government, with $4.68 million due at 2015 end. Post 2015, the newly-inducted government attempted to lean on India, Japan and even the West for economic support. But it soon realised that China was its only hope. In order to plug the existing debt, the government began taking more loans from China, with the Central Bank ultimately drawing up an estimate of $3 billion debt at the end of 2017. However, according to an official from the Sri Lankan government, the amount was, in reality, a little over $5 billion, reported NYT. A year after the new government came into power, it realised the extent of debts that had surmounted due to the port project was enormous. By 2016, the Sri Lankan government began negotiating with China, in a bid to rid the port off its balance sheet. The Times, the only option Sri Lanka was given was the choice of company that would take over – either the China Harbour or China Merchants port. The China Merchants’ Port ultimately took the contract, with the final agreement worth $1.1 billion also giving it 15,000 acres of land around the port for development purposes. The deal, signed in December 2017, also gave Sri Lanka a 15% stake in the port ownership. This, however, meant hardly anything given the enormous leverage China still had, analysts told NYT. Further, apart from Hambantota port, China also reportedly has a stake in the Colombo port. In effect, this strengthens China’s avenues of possible military use, although the Sri Lankan officials have time and again reiterated that the agreement does not allow for China’s military use of the port without Sri Lanka’s invitation.